How do you feel about a full Atroxian Realm sequel? I know I just released the Alphamatic and a lot of people haven't had time to play it yet, but I'd like to share some preliminary thoughts on a full Atroxian Realm sequel. This isn't a game announcement so much as me soliciting some discussion and getting advice on a few things. I can't guarentee this sequel will actually happen. For one, I'm about to enter my senior year of college, and that means I'll be plenty busy trying to find a job, dealing with life, working on other projects, etc. I don't expect that production would begin on this game any time soon. And, I hate to bring this up, but... as passionate as I am about making Keen games, I do have to question whether it's worth spending hundreds and hundreds of hours on a game that will only ever reach a tiny audience. And, it would be nice to be able to make a game that I can actually own and sell. That doesn't mean I won't do it, but I do have to ask myself whether it's worth the time and effort. Will many people even be around to play it several years from now? I hope so. This might not be to everyone's taste, but I want a more involved story this time around. This means a lot more characters and events in the narrative. Because the dialogue got a bit heavy in Atroxian Realm and The Alphamatic, I'm hoping to integrate more of the story directly into gameplay. Maybe some conversations could happen in the middle of gameplay, or Keen could find bits of lore scattered throughout the world. I do have a rough draft of much of the story planned out, though it's very much a WIP. Tonally, I'd like this to feel like a dark mystery thriller and a grand conclusion to the story. Atroxian Realm got pretty dreary/mature at times, though, and I'd like to move away from that feeling. I'd like to spreads the events out across many chapters, with each chapter containing a chunk of gameplay and story (maybe a few levels, or an important gameplay sequence). Chapters will vary in design. Some will be rather linear level sequences, while others could be more open-ended and promote exploration. My current story draft has about 18 chapters, and I might split the game up into two volumes, each a separate game release. This is the big one. I want Keen, Lindsey, Barker, Oracle Janitor, and Spot to all be playable at various points in the game, since the story is a joint adventure with all of them. Each character could have their own special abilities. Keen has the pogo. Maybe Barker could have an ankh-based invincibiliy power, Spot could have the ability to see secret passageways, or Lindsey could jump really high, as examples. I haven't figured out how switching between characters would work, but this could allow a hint of Metroidvania-style design in some chapters. Maybe the player finds an area that only Lindsey can access and has to return once she's been rescued. This is all hypothetical, but I really think level design built aroud multiple characters could be an interesting evolution for Keen. This also means I can develop these characters more and make them integral to the story. This stuff is all up in the air, but I'm considering how other features could be worked in. For example, maybe there are space shooter combat sequences with the BWB inspired by the Galaxy Defender mod by Dr. Colossus. Or, maybe there is some kind of upgrade system where you can spend points to upgrade abilities. The point is, I want this to feel like a very different style of Keen game to keep things fresh. This is the engine used for Atroxian Realm. It definitely expands the capabilities of modding but is still prone to a lot of the major limitations, especially memory. I have serious doubts that multiple playable characters, for example, would work well with the memory constraints of this engine. Perhaps this engine could be modified or rebuilt, but I do not understand how it works well enough to know those answers. I know of Omnispeak and CKGenius, but I'm not very familiar with these engines. It's very important to me that the physics and behavior feels almost indistinguishable from the original, and I'm not positive these engines are quite there yet. I'm not trying to disparage the creators of those engines, though, and I'd be happy to talk more about it. Perhaps the most challenging, but also the most appealing option. At this point, I would pretty much be making a fangame. If I can get past the massive hurdle of implementing a near-perfect Keen engine, this would free me up to do pretty much anything I could possibly want, and I'm fairly proficient at Unity development. I did start working on some early experiments with getting things like resolution and color correct, and the possibilities are amazing. I wrote some shaders that ensure that anything on the screen matches the native Keen resolution (320x200) and 16 color format. This means I can things like adding lighting effects to the tiles/environments, creating dynamic particle effects, and even adding 3-d models that can blend with the rest of the Keen style. It's a cool way to preserve the classic Keen style while also taking it to the next level. Here's some screenshots that illustrate several test effects. The first shows some smoke and snow particle effects. The second shows a dark spotlight effect with snow particles. The third shows cubes as an example of how 3-d objects could be integrated in game. These are very unrefined but show the basic idea of what's possible in Unity. Potentially, I might be able to translate some of lemm's physics code into Unity C# to get more accurate physics. Unfortunately, these engines are so different that it's a very complex task. I may end up needing help if I take this route. I'd love to know if a full Atroxian Realm sequel is something you all want to see. If most people don't feel particularly enthused about it, then maybe it isn't worth my time. But, even if it doesn't enter production for a long time, I'm at least having a lot of fun planning it. Is it crazy ambitious? Maybe, but I am excited about it. I'm open to suggestions and feedback on this (vague) proposal. Is there anything you'd like to see out of a sequel? Any ideas from Atroxian Realm that you especially liked or things you want changed? I may be open to sharing story details with select people in the future. Side note: I also worry occasionally about publishers cracking down on fangames with cease-and-desist takedowns. Zenimax has shown that they are capable of targeting id software fangames like DoomRL. Though the Keen community has been small and ignored so far, I wouldn't want to make myself or the community a target for legal trouble. This is long, woah. Thanks for reading I appreciate your interest and thoughts. I would love an Atroxian Realm sequel! I've replayed AR multiple times since its release because it's so good. Of course, I understand if scheduling doesn't permit the production of another huge mod like that. Personally, I'd like it to stick with the Dreams source engine if possible. That guarantees the classic physics, besides feeling a lot more Keenish to me than running on a non-DOS platform. I speculate that a trick similar to Lemm's Vorticons V2 could be pulled to implement the character switching: put each character's frames in their own EGA file and swap out those files when the current character changes. (That's if there's a limit on sprites in general - I'm not sure if EGA chunks impact memory usage if they're not cached at the moment.) If you need more distinct tiles for all these chapters, an EGA swap trick would be perfect, assuming it's doable. If that is the route you choose to take, I can arrange for level editor support. I also offer my engineering assistance in general, to the best of my (admittedly limited) DOS programming abilities. 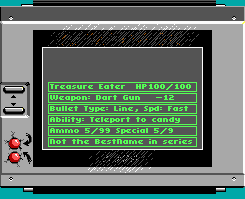 The engine needs about 5 bytes per EGA chunk (2 bytes for the mempointer and 3 bytes for the EGAHEAD data). But the way the actor states are implemented makes it difficult to add texture swaps for the player. You'd have to create duplicates of all the state structs and might also need to create duplicates for some parts of the actor code. Needless to say that this would require way more memory than the additional EGA chunks themselves. But if you want to give each player character different abilities, there's probably no alternative to this. I would love a sequel. I'm personally of the camp that doesn't care if it's a mod as long as it's a good game. I guess that's my feedback on that front. ...For that reason, I feel like I'm kind of leaning toward the Unity option; the potential seems unreal (er, even if it's not Unreal). But I also feel that the other two options are just as valid. Just please make something with those shaders! We've already had a (Dreams) mod with two characters and I did some preliminary work on a two player mod (I will finish one year or other!) I already know how to have different bat files load different graphics (That's the Valentine's Keen update.) For the standard Keen 4 code I have some well developed patches for multiple characters. (Plus I want Keen to crouch, crawl and maybe use grappling hooks.) My limits are patching Keen 4's default amount of graphics and... well I'm more experienced with the original game engines. I burn for an AR sequel, I MUST know how the story ends. My desire for it is like the core of a star, shielded by many layers of plasma but fueled by a boundless energy that will make me explode if left for too long. To me it's never been about the audience, or I'd be in mobile games. I mod Keen because it's something I'm passionate about, something I enjoy. My thoughts are never 'Won't it be wonderful when so many people play this?' but 'Isn't this fun? How can I push my limits further?' This is part of the reason that I can go off of modding when pushed, nagged or unmotivated. To me it's less quantity and more quality. You can make a game, any game, sure. But what will set that game apart? Make what you do unique? There are many games but only one Keen. Perhaps you can make a more 'relevant' game that is all you. Be it platformer, FPS, 2D or 3D, maybe you can turn your talents to such projects and produce something you can be proud of, not just on mere technical achievements or popularity but as an end in of itself. For me at least however Keen is my only option. This is tricky and not my forte (Any future projects will involve limited alternate players, somewhat like how Biomenace allowed you to become a blob.) Interesting concepts but I prefer one character with multiple mechanics. So you're probably wondering how these ideas could even work in a Keen mod. So am I! This is one of the big questions I want to solicit feedback on. I don't think this could be achieved in a standard mod. Whereas I'm making notes about exactly HOW I'd patch those in, and whether I can steal ideas for future games. For example, I'm pretty sure I could rig it so that in a level transition all the graphics, sounds and music could be changed, in essence letting me combine several mods into one game. It'd be tricky and I'm not sure how smooth it'd look, but I have a plan there that would just need some testing, once I need to make use of it. They can't touch us, we're too informal and disorganized. If you became a legal target it'd be worth it since it'd require far FAR more attention then the community currently commands. I also would like to see what further is possible with the original keens Gridlock, but I see you have a bigger vision. I think original keens would only limit your creativity. So if I were you, I would choose Unity. Keen 58 and 59 with the original Keen sprite - is it possible?!? Going with Unity would definitely give me the most freedom. It's just that there's a lot of challenges in getting the engine working. I'm fairly convinced that patches won't be robust enough (sorry Lass). Plus, I'm hoping to do a lot more of the programming myself. Unity does present other problems besides just replicating the Keen physics. Unity has very poor tools for doing 2d tile placement in-engine, so I'd likely need to implement my own solution in editor or find some way to read data from a level editor like Abiathar. Even then, there may be too many differences in how levels are implemented. Also, audio is a major challenge. I'd probably have to convert every adlib sound into a .wav file. Music would then either have to be .imf converted to .wav files (very large file sizes) or a different format like .midi or even .mp3. There is definitely an advantage in using the Dreams engine if it's flexible enough, but it would still be more limiting. Yeah, it's definitely something I think a lot about. I'm looking to get into the interactive/game design space for a career, and so I do have to think about what working on Keen versus other projects does for my portfolio and future. Admittedly, though, there's something about Keen that always draws me back in. This might be a discussion for another time, but I've also wondered how well a spiritual successor inspired by Keen could fare. I know Tom Hall tried with Worlds of Wander, but I could imagine doing a game much more similar in aesthetics and style to Keen Galaxy while still legally distinct. I do have some vague ideas, like some sort of Uncharted/Keen mix in which a group of treasure hunters (not unlike Keen and his friends) hunt lost alien treasures across the galaxy and encounter lots of wacky places and creatures. Well, I can't exactly say it'll be a simple story. 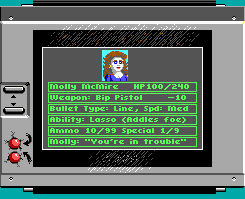 If it isn't already clear from the ending of The Alphamatic, I'm definitely thinking about some plot tie-ins with past Keen games (though hopefully not in the bad retcon kind of way). Spot: I think he could have some ability tied to his eye, maybe with some kind of tech Keen designed for him. I'm thinking it could be some kind of alternate vision (think secret passage vision or maybe something x-ray) that reveals secrets and maybe even enemy weak spots. Though, maybe Spot could also have some sort of laser eye or something. Lindsey: I don't really see her as the offensive type. Unless she has the Vorticon ankh ability, the best thing I can think of is a sort of "infinite" jump. It could be like the jump cheat from Keen Dreams, which lets you jump as high as you want but doesn't let you rejump midair. Or, maybe it could be some kind of ability to hover and move horizontally midair. Oracle Janitor: Honestly struggling with this one. I thought about some kind of cleaning ability like a broom at first, but that seems kind of stupid/useless. Maybe there's something that could relate to the foot or oracle. Creating a 2D tile-map editor is relatively easy. Creating a user-friendly editor is not. If you're going to be the only person using the editor, you could probably hack something together that gets the job done, without spending too much time on the editor itself. Also, audio is a major challenge. I'd probably have to convert every adlib sound into a .wav file. Music would then either have to be .imf converted to .wav files (very large file sizes) or a different format like .midi or even .mp3. There is definitely an advantage in using the Dreams engine if it's flexible enough, but it would still be more limiting. I have code that converts the AdLib sound effects into IMF format, so that they can be converted to WAV with my IMF2WAV converter (used in my Duke Nukem II editor). And since IMF2WAV is a simple command-line tool, you could write a batch file that converts IMF -> WAV -> FLAC/OGG/MP3. And if you want to keep the download size small, you could just put IMF files and IMF2WAV in the download perform this conversion when the game is installed or when it is started for the first time. Have you considered using Reflection Keen's or Omnispeak's code instead of the DOS code as the base for your mod/fangame? This way, you wouldn't have to worry (much) about memory requirements. And since these use SDL, you could probably add support for fully digitized music and sound effects if you wanted to. Right, I'd probably only spend enough time to make something functional enough to speed things up. Admittedly, though, it would be nice to take advantage of a more robust tile editor. I'd also have to consider whether I'd be making this engine just for personal use or if anyone else would want to use it. For sure it'd be great to have a program to convert adlib sounds (rather than have to tediously record every single one in DosBox). I don't think any of your released sound tools have this Adlib -> IMF (or even better, direct Adlib to WAV) functionality, do they? That would certainly make things easier. The installation conversion is also interesting... wouldn't have thought of that. I think short sound effects might not take up too much space, though. Usually it's .wav recordings of music files that start to get within the 20+mb range. I guess it depends on whether I try to stick to the classic sound format or go more modern (if Gamebird returns, I'm sure he'd prefer a modern MP3 format). Possibly. I don't know much about these engines, so I'd have to look into them more. I would need something that's both accurate to the original games and easy to program for. Lots of fun ideas, and of course, a story driven sequel would be a lot of fun! Barker: An Ankh ability is excellent. Other typical Vorticon abilities known from the games are the high jump, the Vorticon Elite's running charge, perhaps some kind of melee ability as I imagine the Vorticon ninja would have. 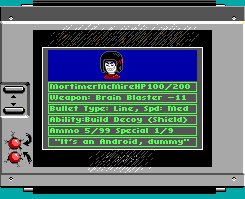 Barker's role in stories has tended to be toward gathering intel, so perhaps he has some kind of scanner for investigating objects of interest. Spot: Yorps are immune to fire so perhaps Spot is adept at navigating hazards. I like the idea that Keen has equipped Spot with a device of some kind. Some incarnation of Coop Keen gave spot the ability to hold his breath and float. He's smaller and could fit in places other characters can't. An ability where he uses his one-toothed mouth might be hilarious, like being able to latch onto walls. Lindsey: We know she floats in Keen 4, can maybe glide. I think she could have a cool 'miragia' ability to turn ethereal and walk through walls or objects of some kind. She has a wand or scepter, which I imagine has some use. Oracle Janitor: Indeed, this one's tough, and I think the best approach would be for any gameplay utilizing him to reflect his inability. He's potentially immortal like the other council members, so perhaps his gameplay revolves around being capture and treated as a non threat. Not sure what I was thinking when I made these, but there may be some interesting ideas to salvage. If the Janitor could temporarily alter the property of tiles with his mop, that might be cool. There's also his bucket, which he can attach to a rope/hook and lower himself down to areas other characters might not normally be able to reach. 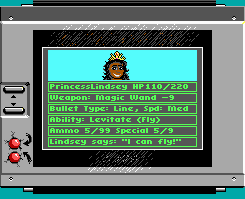 This probably isn't much help, but when you guys mention Lindsey gliding, I keep getting a mental image of Princess Peach in Super Mario Bros. 2 - granted that was only a temporary glide for clearing larger distances, but perhaps something of that ilk? I don't think any of your released sound tools have this Adlib -> IMF (or even better, direct Adlib to WAV) functionality, do they? That would certainly make things easier. K1n9_Duk3's Enormous Tool has a built-in AudioT editor (for PC Speaker and AdLib sound effects only, as Duke 2 doesn't store IMFs in the AudioT file). You can export sounds as WAV files as long as the path to IMF2WAV.EXE is set up correctly in the INI file. But since the tool was designed for Duke 2, it only supports uncompressed AUDIOT.MNI files. I've tried it with the audio files from the Keen 4 Demo and it worked fine for the sound effects. All I had to do was to change the extension of the AUDIOT and AUDIOHED files to .MNI and set the editor's game folder to the directory containing these files. If nothing else works, you should be able to extract the individual AdLib sounds from Keen 4-6 using other tools (like WDC or perhaps Keenwave) and import them (one at a time) into Duke 2's AUDIOT.MNI to be able to export them as WAV files.